PanARMENIAN.Net - The Armenian National Committee of Canada (ANCC) welcomed the adoption of Motion M-587 by the Canadian parliament to declare April of each year as Genocide Remembrance, Condemnation and Prevention Month and to mark April 24 of each year as Armenian Genocide Memorial Day. 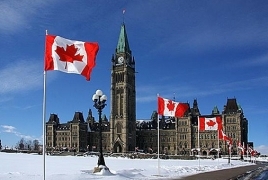 Motion M-587 recalls that three of the genocides officially recognized by Canada (the Holocaust, the Rwandan Tutsi Genocide and the Armenian Genocide) have memorial days in April, so it deems appropriate to designate April as Genocide Remembrance, Condemnation and Prevention Month. The ANCC notes that the designation of April 24 as Armenian Genocide Memorial Day by this motion is the first instance when a Canadian federal government body has formally recognized April 24 as Armenian Genocide Memorial Day.